Above with their new books are Jayleigh Bevins, Jessalyn Collar Carmelia Torro, Bethanne Maple and Meadow Rood. NORWOOD -- A Feb. 26 assembly kicked off Norwood-Norfolk Central's "Reading Week." 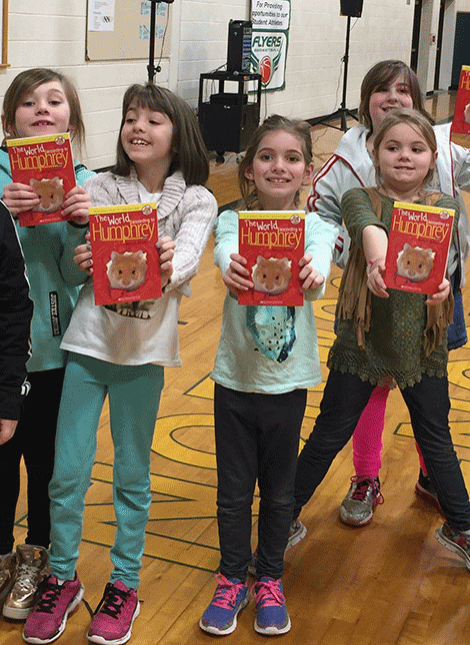 Each student in kindergarten through fourth grade received a copy of the book "The World According to Humphrey" by Betty G. Birney. Students are encouraged to read the book with their families at home as part of the "One School, One Book movement." It is designed to get an entire school community, including parents, involved in reading.